Office environments, like most households, produce a lot of waste. From custom packaging and ink cartridges to discarded paper products, it doesn’t take long for even a small office to produce a lot of waste. That can spell disaster for the environment. Fortunately, there are things you can do to reduce the amount of waste your office produces, and it’s easier than you think. First, it’s important to foster a culture of recycling in the office. To do this, it’s important to make recycling both easy and convenient so you never have to worry about who has got junk all over the place. All too often, people opt to simply throw away recyclable items because it is so much easier to do so. To inspire people to recycle, start by placing recycling bins near the waste bins. You can even purchase bins that are specifically designed for used ink cartridges and other specialty items. It’s just as easy to throw a cartridge into the recycling bin as it is to throw it in the trash, as long as the bin is just as convenient. Print all files as double-sided documents. This will help you to reduce office paper use immediately. It will literally cut your office paper usage in half. This is a great way to improve cost efficiency and get the most out of your office supplies. It is also an excellent way to reduce waste and make your business environmentally friendly, which is so important with the ever-present threat of global warming looming. Another very effective way to reduce waste in the office environment is to go as paperless as possible. In today’s electronic age, it’s possible to do nearly everything digitally. Send invoices electronically. Keep electronic records. Email online newsletters instead of sending out paper correspondence. Take notes during meetings on an iPad. There are many ways to go paperless in an office. Making those changes and encouraging your staff to do things in a paperless way can make a huge difference in the amount of waste you produce as an office staff. Because you can’t always go completely paperless, however, the choices you make in paper products can make a huge difference in the environmental impact your office makes. Recycled paper is a phenomenal choice for any office. It is inexpensive, environmentally responsible and readily available from companies like White Paper. It does have its limitations, however. Because recycled paper does not have the same bright white, smooth finish that new paper has, it can lend a less professional air to printed documents. For that reason, it is best suited to internal printing applications, not for sending out to clients or for promotional purposes. 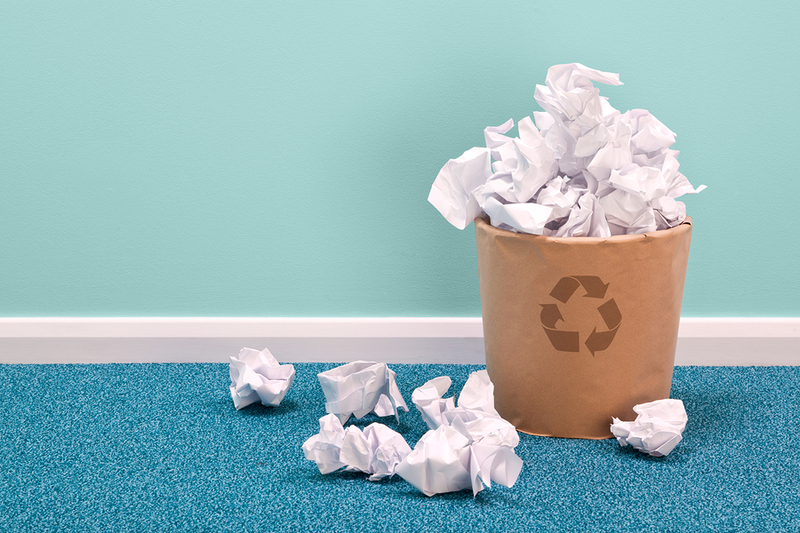 Recycled paper is great for printing emails, sending internal memos, etc. There are lots of ways you can reduce your office’s environmental impact. From providing recycling containers and encouraging litter-free lunches in the office to purchasing recycled paper products for use in-house as well, there are many small steps you can take that will help make your office a more environmentally responsible business. That is something that is not only good for the planet, but it will also paint your business with a positive brush in the eyes of a discerning public. With so many choices for businesses to patronize, more and more people are choosing those that take an environmentally responsible approach to their business practices. That’s a win-win situation for everyone. In December of 2015, Epson released information regarding their first prototype for an in-office paper recycling machine that uses absolutely no water. This innovative product is the future of eco-friendly offices everywhere. In just minutes, this machine will take your used scrap paper and turn it into brand new, clean white office paper so that you can run an entirely green building. Unfortunately, the company has yet to discuss a release date or suggested retail price. However, it is an excellent indicator of where the future of office environmental awareness is heading. If you truly want to lessen your office’s environmental impact, make sure to keep tabs on the new paper recycling solution from Epson.